1UZ 2UZ 3UZ Manual Clutch and Transmission Parts, Accessories & Adapters. We ship globally!! Real employees, real tech support 24/7 365 Days. - IN STOCK! We are Proud to be the only know suppler for the TOYOTA/GETRAG V160 to UZ series V8 adapter! If you are looking to mate the strongest, most die-hard transmission to your V8 swap, this is it! Known to hold over 1300 HP BONE STOCK, the 93-02 Supra turbo, the V160 produced by Getrag is made to withstand years of abuse without complaining about it. Made from ultra strong cold rolled steel then Zinc plated for corrosion resistance, this plate will last until the end of time. This kit will require a Custom SupraStore QMI twin plate 8.5" clutch kit that can hold 850/FT-LBS of TQ--that's an excess of 1000 HP to the wheels! 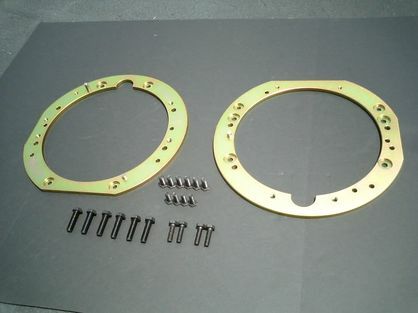 This kit will also require the use of an OS Giken Movement alteration kit for clutch actuation.